Planning a trip to the UK should be pretty simple, right? The language is almost the same, they speak English! So what else could you need before traveling to the UK. Well? one of the things that you will need is a travel adapter plug. Planning ahead which adapter to take and how many will make sure that you have the best trip ever. In today?s world where you cannot imagine anything without the handy electronic gadgets in your hand, it is necessary for you to alleviate some of the stress by having nifty travel devices from travel adapters. However, when you travel especially for vacation, you want to disconnect from the stressful world but even then, you will want to satisfy your urge to stay connected with your dear ones on social sites etc. This WA-7 universal adapter is a type G power outlet plug best suited to the voltage supply of the countries like the UAE, Singapore, Hong Kong, Malaysia, and the U.K where the v9oltage usually ranges from 220v to 250v. 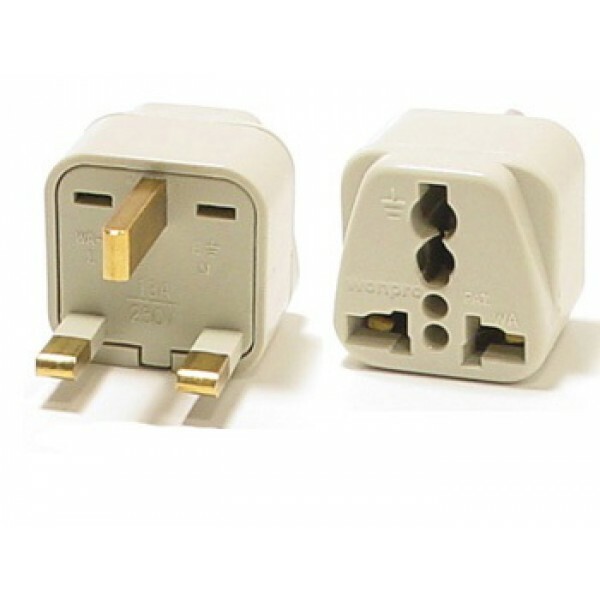 Being a grounded plug adapter it has three pins but they are rectangular shape spaced in a triangular fashion. Its socket also has three rectangular shaped receptacles including a safety switch. As the design of the socket of type G plug is also unique, it is only compatible to type G outlets. It has three rectangular pins arranged in a triangular fashion with ground pin having vertical positionUniversal grounded power plug adapter with the patented universal receptacle design that accepts plugs from most countries including the US and Canada. Note: Power Plug Adapters do not convert voltage, they just change the plug type. Use a proper voltage converter along with a power plug adapter if your device is incompatible with the country's voltage.